monton with the office of President of the Western Canada Synod, L.C.A. More recently in 1980 his title was changed to Bishop of the Western Canada Synod, L.C.A. Donald's wife Trudy works full time as a social worker. Donald and Trudy have four children: Katherine (born 1954) Trepanier who is a public health nurse, Ruth (born 1956) Stayko is manager of a Credit Union, Linda (born 1958) Edwards a teacher in special education, Steven (born 1962) works for Safeway and attends night school taking a business administration course. Donald and Trudy have one granddaughter Teressa Stayko (born 1974). Johan Alfred was born December 13, 1864, at Farila Halsingland, Sweden. He received his education and Military training in Sweden. Johan's wife Margaret was born August 30, 1861, in Sweden. 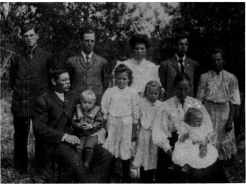 Johan and Margaret and five children; Herman, Victor, Emma, Charles and Lydia emigrated to Canada from Farila Halsingland, Sweden, in 1895. Johan worked as a carpenter in Winnipeg for two years, then in 1897 came to the Rural Municipality of Clanwilliam, applying for homestead on N.E. 12-17-18W on November 29, 1897, received it June 3,1908. This farm is now owned by Elmer Holmberg. In this period, he had built a large home for his family. Since moving to Canada, Johan and Margaret had four more children; Ingrid, Hilma, Alfred and Jenny. All the children attended school at Hilltop. Johan Sjogren was very strong. When he first came to Winnipeg, because of his strength, his co-workers called him strong arm. His sons changed their surname to Armstrong. Margaret was a midwife numerous times. Johan was a jack-of-all-trades, a stonemason, carpenter and photographer. After about twenty years, Johan and Margaret moved to the Townsite of Wasagaming where he built a log cottage for themselves, also others during the Thirties. Johan's hobby was Photography, doing his own developing, taking many pictures of the Clear Lake and Erickson area. In 1935, Johan and Margaret built a home in Erickson. Margaret passed away August 19, 1940. Johan spent the latter part of his life at Hammond, British Columbia, where he passed away February 22, 1951, and is buried in Maple Ridge cemetery. Herman Wilfred, first son of Johan and Margaret Sjogren, was born in 1887, at Farila Halsingland, Sweden. Herman emigrated to Canada with his parents, first to Winnipeg, then in 1897 to the Rural Municipality of Clanwilliam N.E. 12-17-18W. He attended Hilltop school. Herman married Elsie Larson, daughter of Mr. and Mrs. Andrew Larson in July, 1914. Elsie was born November 27, 1896. Herman was a truck driver while in this area. They moved to New Westminster, B.C., where Herman was employed as a painter. They had three children; Vivian, Eva and Norman. Herman passed away at the West Coast. Elsie is residing in British Columbia. Victor Herbert, second son of Johan and Margaret Sjogren, was born March 16, 1889, at Farila Halsingland, Sweden. Victor emigrated to Canada with his parents, first to Winnipeg, then in 1897, to the Rural Municipality of Clanwilliam N.E. 12-17-18W. He attended Hilltop school. Victor married Nellie Benson, daughter of Ole and Ranghild Benson. They made their home in Rural Municipality of Clanwilliam. Victor and Nellie have five children, all born at Hilltop; Billie, Fred, Gilbert, Almer and Delores. Nellie passed away at Hilltop in 1926. Victor married Elsie Reid and they had three children; Charlett, Dorothy and Buddy. Victor passed away in 1959, at Williams Lake, B.C. Emma Kristina was born January 27, 1891. Emma married Nils Bergstrom. (refer to Bergstrom, Nils and Emma). Alfred Sjogren Family. Back Row, Left to Right: Herman, Victor, Emma, Charlie, Lydia. Front Row: Alfred Sr. holding Alfred Jr., Ingrid, Hilma, Margaret holding Jennie. Charles John, third son of Johan and Margaret Sjogren was born January 4, 1893, at Farila Halsingland, Sweden. Charles emigrated to Canada with his parents, first to Winnipeg, then on to the Rural Municipality of Clanwilliam N.E. 12-17-18W. He attended Hilltop school. Charles was a trapper, hunter and carpenter. He married Edna Benson, daughter of Mr. and Mrs. Charles Benson on December 12, 1923. Edna was born April 12, 1907. They lived in the Hilltop district, Onanole and later moved to Haney, B.C. Their children; John, Doreen, Velma were born in Hilltop district, lone was born in British Columbia. Charles passed away Septernbr 13, 1963. Edna is presently living at Haney, B.C.